Patricia Smith's purchases included four houses, 10 vehicles and Mass with the pope. VIP seating for Mass with the pope. A private lunch prepared by the Barefoot Contessa at her barn in the Hamptons. A $5,600 autographed first edition of Harry Potter and the Order of the Phoenix. Those were among the luxuries Patricia Smith and her family enjoyed for nearly seven years, courtesy of her job at Baierl Acura in suburban Pittsburgh. But they weren't fringe benefits. The dealership didn't know it was paying for them until last summer, when Smith, the store's controller, abruptly quit and confessed to embezzling more than $10 million. Smith, 58, told authorities she transferred money to her personal accounts about 800 times, and falsified inventory records and bank statements to cover up her misdeeds. She told friends and family -- some of whom she gave houses and cars -- that her new lifestyle was made possible by a fortuitous airline-stock purchase and work as an online travel agent, according to court documents and local news reports. She spent $1.8 million to charter private jets, traveling to seven countries in Europe and four Caribbean islands. She paid $44,500 for club-level seats at last year's Super Bowl. She had dinner with actor Kevin Spacey. She bought a 4,300-square-foot home for herself and three other houses for two sons and a nephew. She bought 10 vehicles, keeping a 2011 Honda Crosstour for herself and giving the rest to family, including a Ford Shelby Mustang convertible to her husband and a Honda motorcycle to a son. In May, a federal judge sentenced Smith, who pleaded guilty to wire fraud and cooperated with investigators, to 78 months in prison for what he called "mind-boggling" behavior. While the amount Smith admitted to taking -- it averages about $4,000 a day, seven days a week -- is extreme, numerous auto dealerships fall victim to embezzlement every year, experts say. Many thefts are committed by longtime seemingly loyal employees who have access to large amounts of money yet receive little oversight. "We're glad that justice has been served and this matter is now behind us," Lee Baierl, president of Baierl Automotive, said in a statement. "Despite the amount of funds taken over time, there were no adverse impacts to our daily operations. Our business is doing well, and we have adopted stronger measures to prevent such a crime from ever occurring again." Smith, whose annual salary was $53,000, managed to take so much for so long by creating fraudulent records that eluded detection, according to court filings. Beginning in December 2004, she electronically transferred money from an operating account to the company's payroll account and then into her personal bank accounts through a financial institution outside Pennsylvania. She altered the store's ledgers to make the transactions look legitimate and gave fake bank statements to Baierl's outside auditors. Prosecutors said she put sold vehicles back onto the inventory reports that the auditors checked to hide the fact that the accounts should have contained more money, then created a different set of reports for management. She also falsified floorplan loan documents and entered fake balance increases for a reserve account. 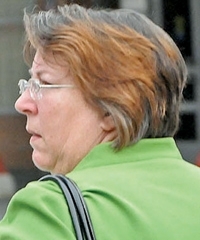 In July 2011, Smith quit after receiving an e-mail from Baierl's CFO questioning some of her accounting. But it's unclear how much management had figured out before Smith voluntarily reported her thefts to the U.S. Attorney's office two weeks later. Lee Baierl declined to be interviewed about Smith, and messages left with three other company executives were not returned. Prosecutors also rejected an interview request. Baierl is a prominent name around Pittsburgh. The family-owned business gave the University of Pittsburgh $5 million to establish the Baierl Recreation Center, and a $3 million gift helped build the Baierl Family YMCA. The company, which was started in 1954, has more than 400 employees and 11 vehicle franchises. It had annual sales of $200 million as of 2007, according to founder Bill Baierl's obituary in the Pittsburgh Post-Gazette. So how could things go so wrong for so long? Ron Sompels, managing partner for the retail dealer services practice at the Crowe Horwath accounting firm, says opportunities for embezzlement have increased as dealers cut back on staff, giving employees more responsibilities and less oversight. "It's a pretty complicated business, and they've got large volumes of transactions," Sompels says. "When you have that type of environment, it's fairly susceptible to fraud. My advice to dealers would be to at least make an assessment of their internal-control environment and understand what risks are out there." Among the most important precautions Sompels says dealers should take is to divvy up duties so that no individual has unchecked access to money flowing through the dealership. "When you get one person in charge of everything, it's a license to steal," he says. "Those are the people that feel like they should be making more money, so they rationalize it that they're due this money. Your hardest working, most trusted worker can turn out to be your biggest thief." That may have been the case at J&C Auto Sales, a small, family-owned used-vehicle outlet in Vineland, N.J., whose former finance and general manager was arrested in March. The man, William Herring, is charged with stealing about $362,000 in cash and vehicles during at least six of the 13 years that he worked there. John Schaser, one of J&C's co-owners, says he had been friends with Herring since the store opened 36 years ago. "You put your guard down, and it's called trust," Schaser says. "It's just something that you never expect. You can't imagine somebody wants to steal from you. ... But there's a million ways that they can do it." Schaser's wife discovered the missing money, and the owners uncovered state records listing the dealership as having sold numerous vehicles that were never in its inventory. Herring was fired and charged with various crimes, including failure to pay income taxes on the illicit income, but Schaser doesn't expect to get any of the money back that he lost. The case is pending. "We're family owned and operated, and he was the only one who wasn't family," Schaser says. • Segregate the duties of individuals who prepare, review and post journal entries and those who post transactions in the areas of accounts payable, cash receipts, payroll, accounts receivable and bank reconciliations. • Management should review the general journal monthly to confirm that all entries are supported, paying special attention to entries posted on weekends and holidays and outside of business hours. • Management should review the cash receipts journal, looking for debits to expense accounts, cost of sales and sales accounts that could be covering up a theft. • Mail should be opened and a cash receipt listing should be prepared by someone independent of the accounts receivable or billing process. Bank deposits should be made by someone independent of the accounts receivable or billing process. • Management should review write-offs of receivable balances. Smith's lawyer, Tina Miller, declined to comment on behalf of her client, whose prison term begins in July. In a sentencing memorandum, Miller said that Smith "suffered from depression and from an abusive childhood, which resulted in compulsive behavior, including excessive spending, shopping and gambling." The memo also said that she compensated by lavishing trips and gifts on those around her. Letters that friends and relatives wrote to the judge describe Smith as a compassionate, generous woman whose criminal behavior came as a shock. They tell of a childhood filled with tragedy, including the deaths of her father and then of her mother, who had tried to buy happiness for her daughters with material possessions. Prosecutors did not pursue charges against any of Smith's family members, who agreed to forfeit considerable amounts of property bought with the ill-gotten funds. Smith was ordered to repay the dealership $10.3 million, but because she spent much of the money on travel, only about $1 million was expected to be recovered immediately. Among the items given up by Smith and her family were 126 pieces of jewelry, 25 gold coins, a mink coat bought in Alaska and a black baby grand piano. Marquet International, a consulting firm that conducts an annual study of embezzlement nationwide across all industries, identified Smith's case as the fourth-largest in 2011. No other crimes involving auto dealers made the study's yearly top 10 list since it began in 2008. The study says that the average scheme netted $750,000 over five years and that only 5 percent of perpetrators had prior criminal records.